Watch the video below first, then I will share with you a few things you can do so you can get into a ready state and ROCK your next meeting! 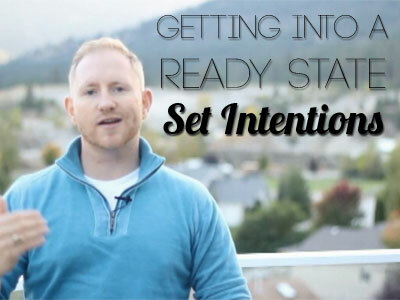 So how do you get into a ready state, a state of flow, and set intentions? Who will you be meeting with? Is it your partner, your boss, an employee, or a potential client? What is happening in their world right now? What problems are they trying to solve? What are the challenges they have in their life? Really imagine that, empathize with them, and put yourself in their shoes. When you start to see things from the eyes of your audience, you can get instant clarity on who YOU need to be. Set intentions for how you want to make people feel and you will win every time. Then when you go into the situation, project that energy for the other person. What would a successful outcome look like at the end of the experience? Work that into your thoughts. Set intentions for your behaviors based on outcomes and don’t get caught up in the little things as you go along. Yesterday I talked about the power of journaling, which is a very helpful tool to visualize with. Write down who you need to be, what the perfect outcome would look like, and how you would project the best energy. Olympic athletes do this all the time. You can see them mentally and physically preparing before their events. You can so the exact same thing! Now use that imagery to really set intentions in your mind on how to replicate those feelings. I will go through this more in detail in another post, but you gotta FEEL it! You can’t control what other’s do, only how you respond, so mentally prepare yourself ahead of time and EXPECT the unexpected. When you are in that ready state, nothing can stop you! Post your comments below on how this works for you, and make sure you subscribe to get additional content like this.